Simon Dawkins, who came through the youth ranks at Tottenham Hotspur, played in a youthful Celtic side's 6-0 loss to Real Valladolid on Tuesday. Celtic fielded former Tottenham Hotspur striker Simon Dawkins as a trialist in their 6-0 loss to Spanish side Real Valladolid on Tuesday afternoon. 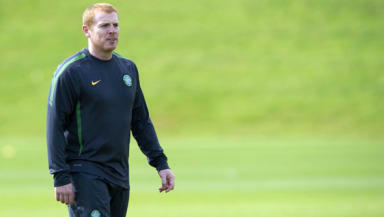 The 22-year-old, available on a free transfer, played the full 90 minutes of the closed doors game at Lennoxtown. Dawkins, who had an injury plagued spell at White Hart Lane, was fielded in an attacking Celtic line-up alongside Ben Hutchison and James Keatings. But he could do little to inspire a youthful Hoops team, who were overwhelmed by their senior opponents. A product of Spurs’ youth academy, the 5ft 10in striker came close to making a top team appearance when he was named on the bench in Spurs’ Uefa Cup qualifier with Anorthosis Famagusta in 2007 but was overlooked for an outing by then manager Martin Jol. A loan spell with Leyton Orient followed in 2008, with Dawkins playing 14 times in the first half of the 2008/09 season without finding the net. He was subsequently released by Spurs but, after failing to win a deal with French side Strasbourg, returned to the London club on a non-contract basis for the 2009/10 season. Celtic boss Neil Lennon used the match as an opportunity to cast his eye over two prospective signings from their Spanish opponents – goalkeeper Jacobo and central defender Cesar Arzo. Both players were withdrawn at the interval as Valladolid ran riot, with goals from Quique, Ruben Sancez, Jofre, Bueno and a Raul Navas double. Jacobo’s agent Gonzalo Arguinano was at Lennoxtown to take in the game, hoping to hold talks with Celtic officials after the game over the possible transfer of the player to Glasgow from the Segunda Division club. Second choice goalkeeper Dominic Cervi conceded three of the goals in the bounce game, before being replaced by Daniele Giordano at the interval.